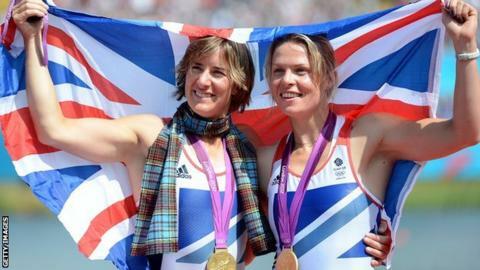 When Katherine Grainger and Anna Watkins crossed the line to win gold at London 2012, it provided one of the fairytale stories of the Games. The eternal bridesmaid with silver medals at each of the previous three Olympics, Grainger had finally hit the jackpot. She had finished what she started 15 years before. She was an Olympic champion. So it was not entirely surprising that she took a break from the sport, using the time to finish her PhD in homicide, write a book, attend lavish awards ceremonies, take a holiday, and pursue a career as a presenter and analyst with BBC television. But during those two years away from rowing, the nagging question of whether she should return to the sport remained. Did she have the desire to try to do it all over again or was she happy with life after rowing? By Tuesday, 23 September 2014, the deadline enforced by GB Rowing if she wanted to attempt to qualify for Rio 2016, the 38-year-old had made up her mind - and reported for training. When was a comeback on the cards? Last year, Grainger said she felt she and Watkins could go faster but the Glaswegian continued to keep her cards close to her chest with regards to her plans for the future. That decision was made harder, though, when in January Watkins said she would not compete at Rio and defend her title following the birth of her first child. "If Anna was back in a boat, it would have been an easy decision to make," Grainger told BBC Sport, just moments after completing her first session in a single scull boat for more than two years at the GB Rowing HQ at Caversham. "I've agonised over this decision for a very long time. There was no one moment of 'eureka'. "Some days, I would be driving and suddenly I would think 'That's me done, I'm never going to do rowing again. I'm ready for retirement. I'm prepared to walk away'. "Then 48 hours later, I'd be doing something else and suddenly think 'I want to go back, I can't imagine why I wouldn't'." Then a year ago, she was involved in a women's eight, made up of Watkins and GB Olympians from the 1992, 1996, 2000 and 2004 Games, most of whom had retired. Once a week, she would head out on the water again. "It was the only thing I did rowing-wise," she said. "And it captured my love for it all over again. "It reminded me how lovely it is being with fellow rowers and how at a basic level, taking away the excitement of competing at an Olympics, rowing is a fantastic sport to be part of." Watching her former team-mates compete in the World Championships in Amsterdam last month, where Grainger worked as an analyst for the BBC's coverage, proved to be a key factor, too. She explained: "It made me realise what I was missing and that there was a hunger. There were some questions I couldn't answer until I was back in a boat, which is why I am doing this." What are the risks, fears and challenges of a return? Grainger has won a medal at each of the last four Olympics. That is an impressive record by any standards - and one that could be tainted if a comeback does not succeed. "I know how hard it is, this is not the easy option," said Grainger. "This is probably the toughest thing I've had to do in my career - to have a break and then come back. "I still have the same expectations I always have done and that's hard to live up to any day, never mind trying to do it after two years away. "There are risks - my health, my career, my well-being, my reputation to name a few. But I have talked to a lot of people. They haven't necessarily given me advice but rather their opinion. That way, I was able to make my mind up with plenty of information in front of me." Among those she consulted was five-time Olympic champion Sir Steve Redgrave, Olympic champion Greg Searle - who spent a decade away from the sport before returning aged 38 to win bronze two years later in the men's eight at London 2012 - Watkins and former crew-mate Cath Bishop. "They understood my dilemma," she said. "And those conversations proved invaluable." Life in the two years away was good for Grainger. She was forging a career in television by working on the BBC's rowing and Commonwealth Games coverage. In between that were opportunities to be a guest at celebrity events, write a book, pick up an honorary doctorate and just lead a normal life. "There's a side to me which doesn't understand why I want to come back, but there is an instinct that I do want it, and ultimately I followed that," she said. "I'll know very quickly if it isn't for me. But if I never take those first few steps, I'll always wonder 'What if?' To me that is harder than actually giving it a go." GB Rowing has welcomed Grainger back to the team at a time when the women's side of the squad is struggling. At the recent World Championships they won just one gold medal through Helen Glover and Heather Stanning, compared to the record-breaking three at London 2012. Grainger explained: "I had a chat with David [Tanner, GB performance director] and he said he was looking forward to it. "They are all aware of the challenge I will present and everyone is supportive of that - that's a big thing for me." What are the boat options and what is the goal? Realistically, Grainger has three boat combinations where she could slot in - the single, the quad and the double, in which she raced to victory in London. The single is arguably the toughest and most competitive boat class and although it would give Grainger more freedom in her training programme, it would be a tough challenge to take on just two years out from Rio, when she will be 40. The quad is a boat in which Grainger has twice achieved Olympic silver, but that second defeat, in Beijing, was tough to take as they were overhauled on the line by China. So, the boat brings with it some difficult memories. The double is one that two-time Olympic champion James Cracknell believes she will be perfect for if GB rowing chiefs are able to find a crew-mate to make a strong combination. "I have a lot of work do," said Grainger. "I have to get myself back to where I expect to be. Only then can I start asking who I want to row with because until I prove myself, no one is going to want to row with me." The first glimpse of her progress will come on 16 November at the first GB winter trial of the season. "I'm not really making long-term plans," she said. "A lot has to go well and fall into place. I have to get my fitness back, get my boat feel back and make sure I'm mentally where I want to be. "The end point would be going all the way through to Rio, but I'm not making a commitment to that one just yet."